Bestselling author and internationally renowned animal psychologist and dog trainer Patricia McConnell “gives a voice to those who can’t speak in words and provides hope for fearful animals everywhere” (Temple Grandin) in this powerful and uplifting memoir about healing. World-renowned as a source of science and soul, Patricia McConnell combines brilliant insights into canine behavior with heartwarming stories of her own dogs and their life on the farm. Now, she reveals that it wasn’t just the dogs who had serious problems. For decades Dr. McConnell secretly grappled with her own guilt and fear, which were rooted in the harrowing traumas of her youth. Patricia is forced to face her past by her love for a young Border Collie named Will, whose frequent, unpredictable outbreaks of fear and fury shake Patricia to her core. In order to save Will from this dangerous behavior, she must find her own will to heal, and along the way learn that will power by itself is not enough. Interweaving enlightening stories of her clients’ dogs with tales of her deepening bond with Will, this is a “compassionate account of the reclamation of the author's life from abuse and shame. An uplifting story of hope about how both dogs and humans need "a sense that they are not helpless victims" (Kirkus Reviews). The border collie puppy had eyes like fuzzy diamonds and fur so soft that my hands melted into it as if they had lost their bones. He was eight weeks old when I met him, sitting on the grass at his breeder’s, with the sheep in the lambing shed bawling to their babies and the crickets buzzing in the woods behind the farmhouse. I didn’t need another dog. I already had three, and I wasn’t looking for a puppy. I was busy. Busy seeing clients whose pets had serious behavior problems, teaching at the University of Wisconsin, cohosting a radio show, giving speeches on canine behavior, writing books, and running a dog-training business. I didn’t need more to do. But I had heard of a litter that was closely related to my once-in-a-lifetime dog, Cool Hand Luke. Luke had not only changed my life, he might have saved it, in a made-for-television moment when I came close to being horribly hurt and he could have died. I’d been pinned in a corner of a horse stall by a Scottish Blackface ewe who had just had a lamb and perceived me as a hungry wolf intent on killing her newborn. When she ducked her head and charged me the first time, I dodged to the right and laughed it off. Then she charged again and just missed me. Her head smashed into the barn wall so hard that a confetti of paint flakes fell from the ceiling. She charged once more and I retreated to a corner, looking around for a piece of wood, a bucket, anything I could use to protect myself. We don’t go through life aware of our own fragility until we have nothing but our own bodies to protect ourselves. No horns. No thick skin and fur. No bristles or claws. Useless little teeth. Put us up against an animal with a built-in security system and we come up short. I’d spent years as an applied animal behaviorist dealing with aggressive dogs. I was used to snarling canines of all kinds who would have bitten me if I’d made the wrong move. But I hadn’t expected to be trapped in the corner of a barn by a crazed ewe. Crystal the ewe charged again and grazed my thigh. She was known for her bad temper, but she was a sheep, not a two-thousand-pound bull or a muscled-up dog threatening to put me in the hospital. But my irritation began to morph into fear. I couldn’t seem to get out of the corner and out of the pen. I was alone on the farm, and if I were badly injured, I wouldn’t be missed for days. That’s when I heard it: thwap! Luke’s paws hit the top of the four-foot stall as he scrambled over the pen like a military dog on maneuvers and hit the ground between Crystal and me. As she turned her attention to him, I scrambled toward the gate. Crystal tucked her head down so far that her chin was tucked under her chest, exposing only her two-inch-thick skull and curved horns. She went for Luke. He charged back, biting at her skull to keep her at bay while I made it out of the gate. After two more charges, Luke made his own escape. A thin stream of blood trickled from his mouth. Two of his front teeth had been broken off. It is one thing to love a dog, to love him so much that sometimes you ache just talking about him. It is another thing altogether to know that he risked his life to save you from serious injury. But Luke was more than the star of this one dramatic moment; he was one of those old souls whose love of life leaves you glowing in its presence. I once wrote about Luke: “I imagine his death as if all the oxygen is sucked out of the air, and I am expected to live without it.” Of course he died, and of course I didn’t—but it took me years to stop grieving his untimely death from kidney failure when he was only twelve years old. That was why the prospect of bringing home his nephew two years later was so seductive, despite having a house full of other dogs. All the dogs in Luke’s line are famous for their noble dispositions; I had high hopes that this litter would have a pup with some of Luke’s personality. Intellectually, I knew full well that every dog is unique, and dogs like Luke are hard to find. But still, how could I pass up the chance that one of the pups of the litter would replicate some of Luke’s brilliance? When I arrived to evaluate the litter, I pretended, mostly to myself, that I was making a careful and considered choice. The puppies tussled on the ground, interrupting their play only to leap after butterflies, sniff my jeans, or lick my face with velveteen tongues. I focused on the two male pups, since I had three females at home already. One male was a big, flashy boy with a wide white collar of fur, the other a bit plainer. I couldn’t decide between them. The breeder allowed to me to take them both home for a three-day trial period. It was a win/win—the pups would be exposed to a new environment at an important age, and I would see how they got along with my other dogs. After a few days, I could decide if one of them was right for me. When I got home, the boys tumbled out of the crate as if out of a clown car. In turn, they met my three other dogs, each of whom performed a leading role at the farm. Tulip, the elderly Great Pyrenees whose radiance of white fur charmed everyone she met, was struggling with irritable bowel syndrome and a progressive neuromuscular disease. She’d been in the critical care unit at the local vet school three times that year. After each incident, she recovered and went back to being the farm’s jokester, a cross between an oversize seal pup and a benevolent polar bear. For twelve years she had multitasked as the farm’s protector and stand-up comedian. I felt I owed her anything I could do to keep her comfortable. Pippy Tay, a fifteen-year-old border collie, had always been a paragon of health. For years, she was Watson to my Sherlock, assisting me in teasing out the reasons why so many of my clients’ dogs were aggressive to members of their own species. Over the years I’d seen at least a hundred dogs standing stiff-legged and snarling while Pippy bowed and curtsied a safe distance away. Within minutes, the visiting dog would melt like ice cream in the sun, and soon they would be playing, while my clients’ eyes filled with tears of happiness. But Pippy was losing her eyesight and hearing and had long since been retired. I was thrilled she had done so well for so long; I had never counted on her living to the ripe old age of fifteen. Like Tulip, she now needed a lot of care. My third dog, Lassie, a twelve-year-old border collie, was the baby of the group. Vital and energetic, my go-to dog on sheep and still as playful as a puppy, Lassie nonetheless suffered from chronic bladder infections that belied her youthful looks. We spent untold hours with veterinarians trying to figure out what was wrong. You might say that this was not an ideal time to get a puppy. You would be right. I calculated that I had been bringing my dogs to the vet 2.4 times a week for almost half a year. You know it’s bad when you take the time to figure that out. With a decimal. Did I really have the energy to raise a puppy? To be on guard at all times, to take the pup outside every ten minutes, and to gently remove the shoes, the remote control, or the pillow from its mouth? I had wanted a young dog for several years but had decided to wait until Pippy died. But even in old age, Pippy was thrilled when puppies visited, so I began to rethink my plan. Besides, I needed something healthy and joyful to make me laugh, to remind me that there was more to life than a slow spiral toward death. Both pups settled into the farm quickly enough, following the tracks of chipmunks behind the house, playing with toys on the threadbare Oriental rug in the living room. But one of them followed me everywhere and seemed to care deeply about what I was doing and where I was going. His brother was better-looking but a bit more independent. Every time I gazed down at the plain one, he was looking up at me with soft, radiant eyes. What is it about eyes that convey so much information but whose qualities seem beyond language? We have so few words to describe the depth of spirit and emotion conveyed by eyes that they all seem a bit trite. But it was his eyes that hooked me. I’d look down at this black-and-white fluff ball, and he’d gaze at me, his eyes looking deep into mine. Imploringly, as if always asking me a question. I didn’t know what it was, but somehow it seemed imperative that I find the answer. I knew by the end of the first day that I couldn’t let him go. I named him Will. That night, Will and I cuddled together on the living room floor, his little puppy body curled up on my stomach while the three girls encircled us. I stroked their bellies and scratched their ears and murmured to them that life was good, and no matter what happened next, love and determination would see us through. 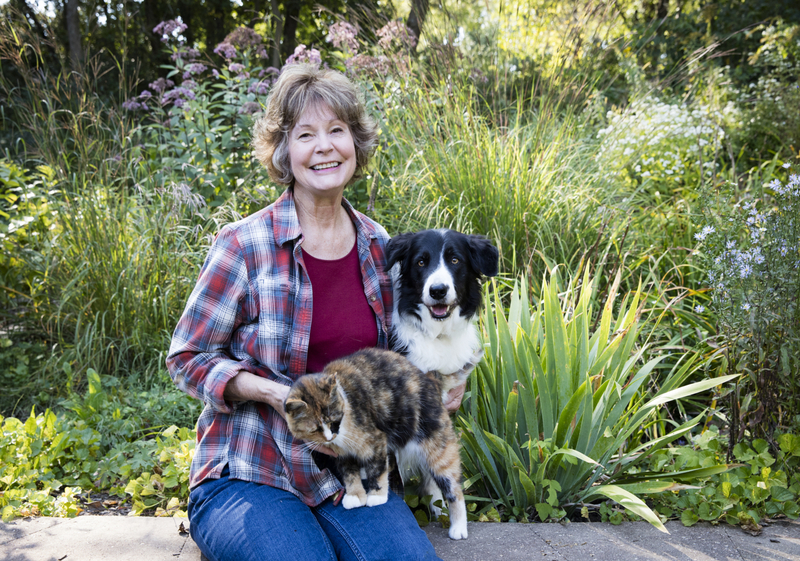 Patricia McConnell, PhD, CAAB is an Ethologist and Certified Applied Animal Behaviorist who has consulted with cat and dog lovers for over twenty years. Her nationally syndicated radio show, Calling All Pets, has played in more than 110 cities for fourteen years. She is the behavior columnist for The Bark magazine and a Consulting Editor for the Journal of Comparative Psychology. She has retired from her position as Adjunct Associate Professor in Zoology at the University of Wisconsin-Madison. She is the author of ten books on training and behavioral problems, as well as the critically acclaimed books, The Other End of the Leash: Why We Do What We Do Around Dogs, For the Love of a Dog: Understanding Emotion in You and Your Best Friend, and Tales of Two Species. "This powerful memoir twines the lives of an extraordinary dog and an extraordinary woman. Their courageous, compelling story will profoundly deepen your understanding of people and animals, fear and shame, love and listening." "This inspirational memoir is, above all, a book about redemption. McConnell faces her own history of trauma as she tries to understand and heal her fearful, reactive border collie, Willie. Replete with McConnell’s fascinating and often humorous insights about working with wonderful and sometimes wounded dogs, this is much more than a book about training dogs. The Education of Will engages in an intimate and challenging conversation with the reader: about saving yourself, saving others, and allowing others to save you. It is original, powerful, heartwrenching in its honesty — and filled with a comforting, gentle grace." "Patricia McConnell may be the finest popularizer of the science of animal behavior we have today, and for many dog owners, myself included, she’s long been a wise and witty guiding light. With The Education of Will, her intensely personal and frankly brave memoir, she examines her own traumatic history with characteristic insight, honesty, and intellectual tenacity. The result is a fascinating portrait of the deepest of connections being forged between one woman and one dog — and just how high the stakes are for both. Patricia McConnell is a treasure, and we're very lucky indeed that she wrote this story." "An unflinching look at trauma and how one woman grows beyond it—beside a wondrous, troubled spark of a dog who needs her help and helps her know herself. Wisdom earned in the hardest places, dog and human, carries with it a message of hope. The Education of Will is riveting from the first page to the last and will reach many readers who long to put all kinds of burdens down." "McConnell has written an inspiring and courageous book about the mysteries of the love between humans and dogs and how that love can bring healing and forgiveness after trauma. Anyone who has ever loved a pet—especially a dog—will discover new and powerful insights into how that bond can lead to liberation, even from even our most hidden and crippling shames. The Education of Will brought me to tears and laughter, amazement and admiration. McConnell has dramatically advanced the growing body of literature that explores post-traumatic stress syndrome and how our life force—and that of our beloved dogs—leads us to truth-telling and a reconnection with ourselves and society." 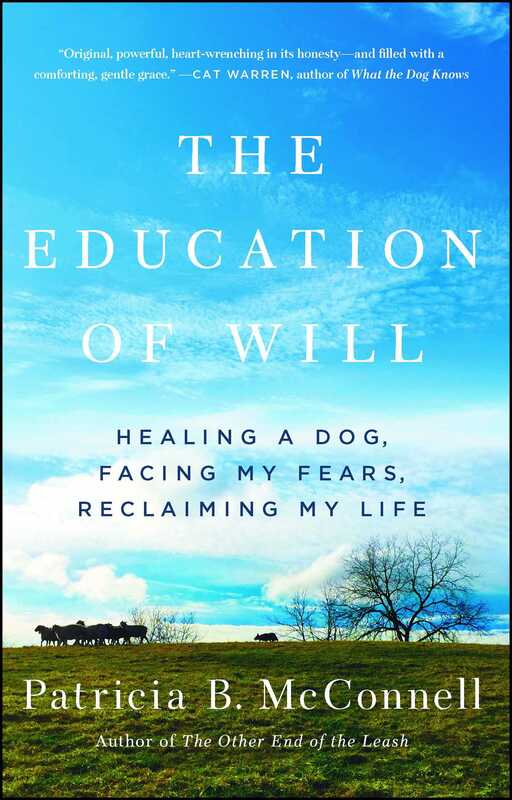 "In The Education of Will, Patricia McConnell writes with unflinching honesty, vulnerability, and warmth. She wraps her reader in the highs and lows of a life lived beautifully, through gut-wrenching traumas, hard-won victories, unexpected romances, and tear-jerking setbacks. Through it all, McConnell depicts the natural world (and of course, dogs) with masterful reverence and passion. A tremendously winning memoir." – NICKOLAS BUTLER, author of Shotgun Lovesongs, Beneath the Bonfire, and The Hearts of Men. "Patricia McConnell has written the You Just Don't Understand of the human-canine relationship. . . . This humorous, well-written book tells us what to do and what to avoid based on years of studying dogs and their primate owners." – Frans de Waal, Ph.D., author of Are We Smart Enough to Know How Smart Animals Are? "A compassionate account of the reclamation of the author's life from abuse and shame. An uplifting story of hope about how both dogs and humans need 'a sense that they are not helpless victims.'"